Objective: To investigate the evidence-based treatment of catatonia in adults. The secondary aim is to develop a treatment protocol. Materials and methods: A systematic review of published treatment articles (case series, cohort or randomized controlled studies) which examined the effects of particular interventions for catatonia and/or catatonic symptoms in adult populations and used valid outcome measures was performed. The articles for this review were selected by searching the electronic databases of the Cochrane Library, MEDLINE, EMBASE and PSYCHINFO. Results: Thirty-one articles met the inclusion criteria. Lorazepam and electroconvulsive therapy (ECT) proved to be the most investigated treatment interventions. The response percentages in Western studies varied between 66% and 100% for studies with lorazepam, while in Asian and Indian studies, they were 0% and 100%. For ECT, the response percentages are 59%–100%. There does not seem to be evidence for the use of antipsychotics in catatonic patients without any underlying psychotic disorder. Conclusion: Lorazepam and ECT are effective treatments for which clinical evidence is found in the literature. It is not possible to develop a treatment protocol because the evidence for catatonia management on the basis of the articles reviewed is limited. Stringent treatment studies on catatonia are warranted. The pathophysiology and etiology of catatonia remains unclear. One of the hypotheses is that it may be explained by an alteration of the dopaminergic function.10,11 In addition, dysfunction of gamma-aminobutyric acid and glutamate systems may be implicated.12 Benzodiazepines and electroconvulsive therapy (ECT) are the most widely studied treatment methods. However, no uniform treatment method has yet been brought forward. To compare the differences in effects between medication, ECT and placebo, and to develop uniform advice, a Cochrane review was performed based on randomized controlled studies (RCTs). However, the conclusion was that none of the studies could be included in this review.13 A controlled study on the treatment of (chronic) catatonia in people with schizophrenia showed that benzodiazepines have no added value compared to placebo.14 Until now, no broadly accepted treatment guidelines have been described for catatonia. The purpose of this review of the literature is to establish the evidence-based treatment for catatonia in adults. The secondary aim is to develop a treatment protocol based on the available evidence. The study design was based on the Preferred Reporting Items for Systematic reviews and Meta-Analyses (PRISMA) method.15 We searched the databases of the Cochrane Library, MEDLINE, EMBASE and PSYCHINFO in July 2016 using catatonia (and related terms) AND treatment (and related terms) as keywords. We deliberately chose the general term treatment to obtain the broadest possible spectrum of treatment interventions. The main prerequisites were that the articles had been published in either English or Dutch language and that abstracts were available. Articles were selected for inclusion by two authors independent of each other on the basis of predefined inclusion criteria. Treatment manuscripts (irrespective of design) that investigated the effects of particular interventions on catatonia and/or catatonic symptoms in adult populations were included. Case series were included when at least three cases were described. A report was included if response to treatment was measured using a standardized rating instrument or scale. Consequently, all the included full-text articles were analyzed. The results of the included articles are presented in Tables 1–3. Abbreviations: BFCRS, Bush–Francis Catatonia Rating Scale; d, disorder; DSM, Diagnostic and Statistical Manual of Mental Disorders; ICD, International Classification of Diseases; IM, intramuscular; IV, intravenous; MRS, Modified Rogers Scale; PASS, positive symptoms subscale; PO, per os, oral administration; SAS, Simpson–Angus Scale; SCID, structured clinical interview for DSM disorders. Abbreviations: BFCRS, Bush–Francis Catatonia Rating Scale; CGI-I, Clinical Global Impression for improvement; d, disorder; DSM, Diagnostic and Statistical Manual of Mental Disorders; ECT, electroconvulsive therapy; ICD, International Classification of Diseases; IV, intravenous; SCID, structured clinical interview for DSM disorders. Note: aNumber of participants at final follow-up. Abbreviations: BFCRS, Bush–Francis Catatonia Rating Scale; CGI-I, Clinical Global Impression for improvement; DSM, Diagnostic and Statistical Manual of Mental Disorders; IV, intravenous; PANSS, Positive and Negative Syndrome Scale; SCID, structured clinical interview for DSM disorders. Our search strategy using Ovid database revealed 3,079 potentially relevant manuscripts in the Cochrane Library, MEDLINE, EMBASE and PSYCHINFO. Figure 1 describes the evaluation of these 3,079 publications. Figure 1 Search and selection strategy. Flow diagram for included studies. 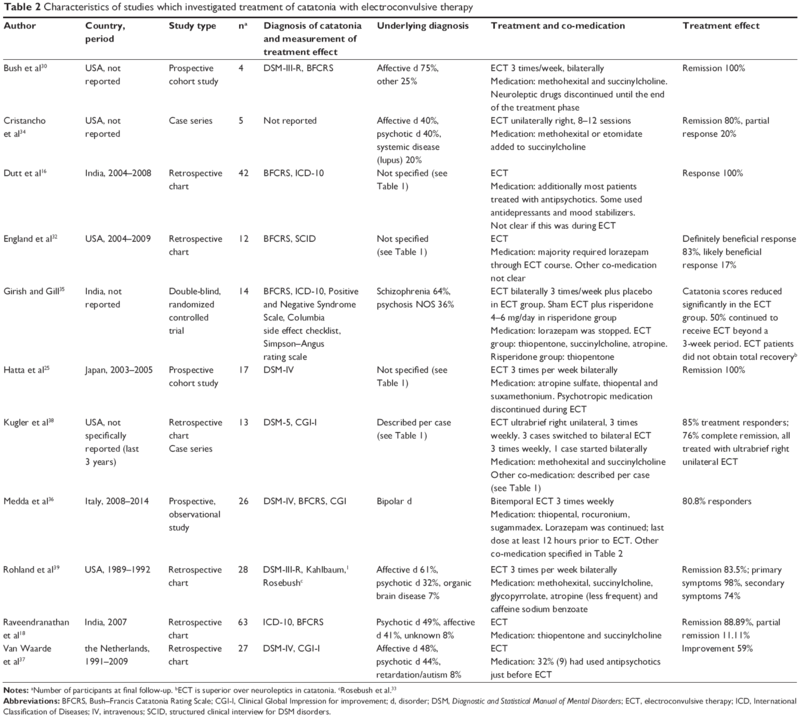 Treatment with benzodiazepines is the most extensively studied treatment method and is reported in 17 studies, of which the study characteristics are described in Table 1. Lorazepam is the most widely studied medication, which is administered in doses varying from 2 to 16 mg/day. Three studies investigated a lorazepam/diazepam protocol, with variable results.20–22 The manner of administration is mainly oral (PO). If PO administration is not possible because of the patient’s mental health state, parenteral methods (intramuscular [IM] or intravenous [IV]) are used. Four studies primarily opted for such a parenteral method.17,19,23,24 The reason for doing so was not mentioned. In most studies, lorazepam is administered PO as well IM and IV. Some studies chose diazepam, flunitrazepam or clonazepam as IM or IV therapy.25–27 Duration of therapy varies from the administration of just one dose to continued administration for as long as catatonic symptoms persist. Two studies27,28 explicitly describe that the effect of lorazepam wears off after 3–5 hours and that the symptoms subsequently return. Eleven studies described the effects of ECT as a treatment method for catatonia. The characteristics of these studies are described in Table 2. In six studies, ECT was administered as a secondary therapy when there was no or insufficient response to benzodiazepines.16,30,32,34–36 ECT was not only initiated after ineffective pharmacotherapy, but also as primary therapy, for example, in life-threatening situations.18,25,37–39 The reported bilateral ECT frequency was three times a week on average.25,30,35,36,38,39 In two studies, ECT was administered unilaterally, the hypothesis being that this would reduce the risk of cognitive side effects.34,38 Because of the small cohort involved in both studies, this hypothesis could not be confirmed. The total number of ECT sessions in the included studies varied from two to 13. 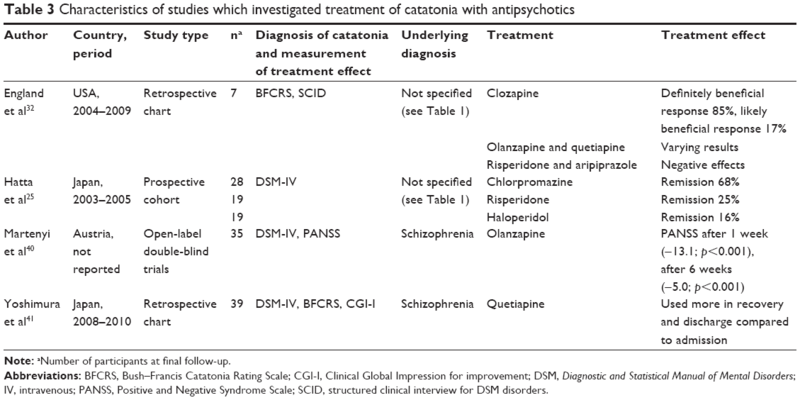 Four studies (Table 3) examined the role of antipsychotics in treating catatonia. It should be noted that the examined cohorts largely consisted of patients with an underlying psychotic disorder. England et al concluded that clozapine has a beneficial effect on catatonic symptoms.32 On the other hand, classic antipsychotics may result in clinical deterioration and appear to be associated with the development of lethal catatonia or malignant neuroleptic syndrome. Hatta et al observed that patients responded better to an antipsychotic drug with low affinity for dopamine receptors (clozapine) than to an antipsychotic drug with high affinity (haloperidol).25 The main disadvantage of this study is that the effect cannot be attributed to any of the used antipsychotics due to the use of co-medication. The use of carbamazepine in the acute phase of catatonia was examined in an open prospective study involving nine patients.23 Carbamazepine was administered when patients did not sufficiently respond to lorazepam. This study revealed that lorazepam initially produces good results, but its effect wears off after a few hours. Eventually, all patients were given carbamazepine, whereupon four patients recovered and one patient showed partial recovery. It should be noted that this study involved a small study group without adequate information about co-medication. McDaniel et al described the effect of topiramate on catatonic symptoms in four cases unresponsive to benzodiazepines and antipsychotics.43 After treatment with topiramate, the patients showed recovery or improvement, but it is not clear whether this improvement was the result of the use of topiramate. Therapeutic efficiacy of the N-methyl-D-aspartate (NMDA) antagonist amantadine has been reported by Northoff et al45 and Freitas de Lucena et al.46 Northoff et al reported three cases with acute akinetic catatonia, in which IV infusion of 500 mg amantadine (if necessary, repeated after 24 hours) led to resolution of catatonic symptoms. Considerable reduction of scores in various motor scales was seen with most pronounced effects 4–6 hours after administration. Patients were not taking antipsychotic or any other psychotropic drugs. It should be mentioned that amantadine might exacerbate psychotic symptoms. Therefore, Northoff et al excluded cases of paranoid schizophrenia. Freitas de Lucena et al evaluated the use of amantadine for 4 weeks in five cases of acute catatonia in schizophrenia of schizoaffective disorder. Doses were increased up to 600 mg/day over a period of 4 weeks. Patients were medication free for at least 72 hours. Antipsychotic medication was reintroduced in the third week. In all five patients, amantadine led to considerable reduction in catatonic symptoms. The best response was observed between 10 and 21 days. There are currently no broadly accepted guidelines for the treatment of catatonia. The articles included in our review all have a level of evidence not exceeding 1b (individual RCT), of which most do not exceed 2b (individual cohort study).47 In addition, the diversity of methods and outcome measures used makes unambiguous interpretation of these studies impossible, and therefore, it was not feasible to develop an evidence-based treatment protocol. However, the investigated articles clearly show similarities in terms of design and results, which may prove useful in clinical practice and are a starting point for further research. ECT is a very effective therapy for catatonia, also when benzodiazepine (lorazepam) trials have failed.16,18,25,30,35,36 The response percentages vary between 59% and 100%.18,25,30,34,39 The reason why this therapy is a secondary treatment option (in most cases) is that ECT cannot be administered in all settings and because of the potential side effects. The role of antipsychotics in treating catatonia is not entirely clear. They do seem to be an appropriate therapy when a psychotic disorder is considered to be the underlying cause of catatonia. In these cases, the results of the articles suggest to select an atypical instead of a typical antipsychotic to avoid the risk of deterioration of catatonic symptoms and induction of extrapyramidal movement disorders. There is insuffient evidence to confirm the therapeutic effects of carbamazepine, topiramate and amineptine. Studies about NMDA antagonists do stress the importance of the potential involvement of glutamatergic dysfunction. However, double-blind control trials are needed to elaborate further on this hypothesis. In summary, the results clearly showed that benzodiazepines and ECT are the only treatments for which there is clinical evidence. Identifying and treating the underlying disorder is essential in the treatment of catatonia. Moreover, the role of antipsychotics is not yet entirely clear. However, there does not seem to be evidence for the use of antipsychotics as therapy for catatonic patients without any underlying psychotic disorder. Typical antipsychotics can worsen the clinical picture. On the basis of the investigated articles, we were not able to develop a treatment protocol because the evidence for catatonia management is limited. Therefore, an urgent need is warranted for more stringent intervention studies in people with catatonia. The authors thank Gertie van Bergen and Christien Geelen for their secretarial support and Sanne Rasing for her support in designing the review. In the past, Frank MMA van der Heijden has received some personal fees from Lundbeck, Takeda, Servier and Janssen-Cilag (participation in advisory board and speaker fees). The authors report no other conflicts of interest in this work. Kahlbaum K. Die Katatonie oder das Spannungsirresein. [Catatonia]. Berlin: August Hirschwald; 1874. German. Kraepelin E. Dementia Preacox and Paraphrenia (RM Barclay, Vert.). Huntington, NY: R.E. Krieger; 1919. Van der Heijden FM, Tuinier S, Arts NJ, Hoogendoorn ML, Kahn RS, Verhoeven WM. Catatonia: disappeared or under-diagnosed? Psychopathology. 2005;38(1):3–8. Fink M, Taylor MA. Catatonia: A Clinician’s Guide to Diagnosis and Treatment. Cambridge: Cambridge University Press; 2003. Caroff S, Mann S, Francis A, Fricchione G. Catatonia: From Psychopathology to Neurobiology. Washington, DC: American Psychiatric Publishing; 2004. American Psychiatric Association. Diagnostic and Statistical Manual of Mental Disorders: DSM-IV. 4th ed. Washington, DC: American Psychiatric Publishing; 1994. Tandon R, Heckers S, Bustillo J, et al. 2013. Catatonia in DSM-5. Schizophr Res. 2013;150(1):26–30. American Psychiatric Association. Diagnostic and Statistical Manual of Mental Disorders: DSM-5. 5th ed. Washington, DC: American Psychiatric Publishing; 2013. Ungvari GS. Catatonia in DSM-5: controversies regarding its psychopathology, clinical presentation and treatment response. Neuropsychopharmacol Hung. 2014;16(4):189–194. Northoff G, Demisch L, Wenke J, Pflug B. Plasma homovanillic acid concentrations in catatonia. Biol Psychiatry. 1996;39(6):436–443. Yamamura S, Ohoyama K, Hamaguchi T, et al. Effects of quetiapine on monoamine, GABA, and glutamate release in rat prefrontal cortex. Psychopharmacology (Berl). 2009;206(2):243–258. Unal A, Bulbul F, Alpak G, Virit O, Copoglu US, Savas HA. Effective treatment of catatonia by combination of benzodiazepine and electroconvulsive therapy. J ECT. 2013;29(3):206–209. Gibson R, Walcott G. Benzodiazepines for catatonia in people with schizophrenia and other serious mental illnesses. Cochrane Database Syst Rev. 2008;4:CD006570. Ungvari GS, Chiu HF, Chow LY, Lau BS, Tang WK. Lorazepam for chronic catatonia: a randomized, double-blind, placebo-controlled cross-over study. Psychopharmacology (Berl). 1999;142(4):393–398. Liberati ADGA, Tetzlaff J. 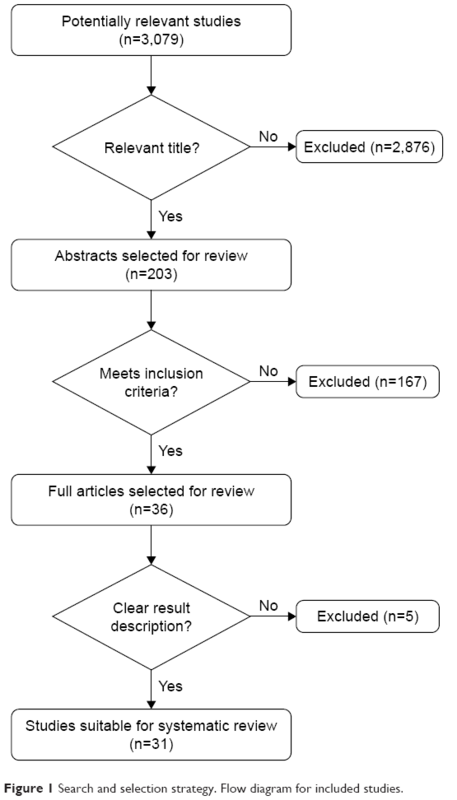 The PRISMA statement for reporting systematic reviews and meta-analyses of studies that evaluate healthcare interventions: explanation and elaboration. BMJ. 2009;339:b2700. Dutt A, Grover S, Chakrabarti S, Avasthi A, Kumar S. Phenomenology and treatment of Catatonia: a descriptive study from north India. Indian J Psychiatry. 2011;53(1):36–40. Narayanaswamy JC, Tibrewal P, Zutshi A, Srinivasaraju R, Math SB. Clinical predictors of response to treatment in catatonia. Gen Hosp Psychiatry. 2012;34(3):312–316. Raveendranathan D, Narayanaswamy JC, Reddi SV. Response rate of catatonia to electroconvulsive therapy and its clinical correlates. Eur Arch Psychiatry Clin Neurosci. 2012;262(5):425–430. Tibrewal P, Narayanaswamy J, Zutshi A, Srinivasaraju R, Bada Math S. Response rate of lorazepam in catatonia: a developing country’s perspective. Prog Neuropsychopharmacol Biol Psychiatry. 2010;34(8):1520–1522. Huang YC, Lin CC, Hung YY, Huang TL. Rapid relief of catatonia in mood disorder by lorazepam and diazepam. Biomed J. 2013;36(1):35–39. Hung YY, Huang TL. Lorazepam and diazepam rapidly relieve catatonic features in major depression. Clin Neuropharmacol. 2006;29(3):144–147. Lin CC, Huang TL. 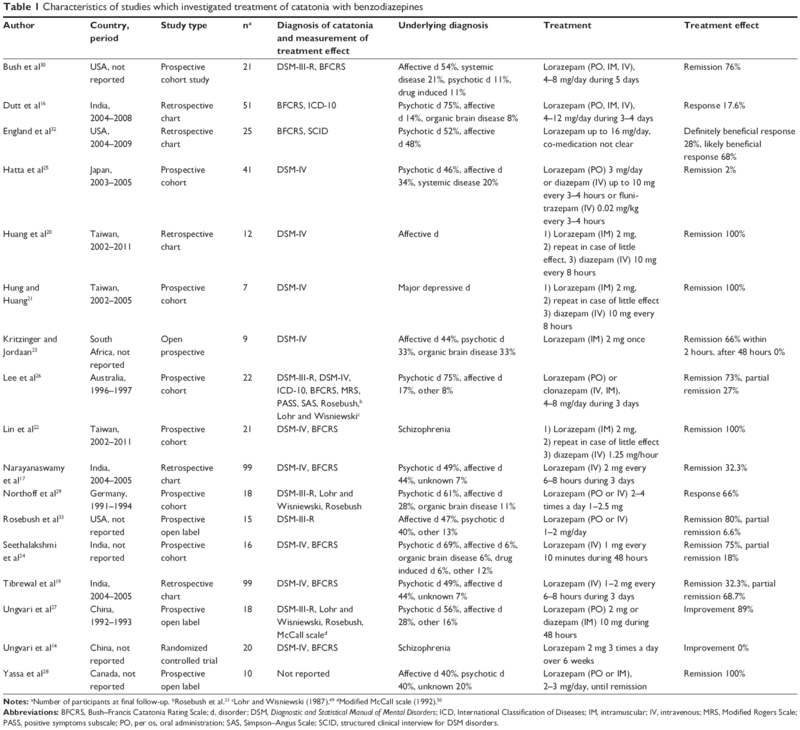 Lorazepam-diazepam protocol for catatonia in schizophrenia: a 21-case analysis. Compr Psychiatry. 2013;54(8):1210–1214. Kritzinger PR, Jordaan GP. Catatonia: an open prospective series with carbamazepine. Int J Neuropsychopharmacol. 2001;4(3):251–257. Seethalakshmi R, Dhavale S, Suggu K, Dewan M. Catatonic syndrome: importance of detection and treatment with lorazepam. Ann Clin Psychiatry. 2008;20(1):5–8. Hatta K, Miyakawa K, Ota T, Usui C, Nakamura H, Arai H. Maximal response to electroconvulsive therapy for the treatment of catatonic symptoms. J ECT. 2007;23(4):233–235. Lee JW, Schwartz DL, Hallmayer J. Catatonia in a psychiatric intensive care facility: incidence response to benzodiazepines. Ann Clin Psychiatry. 2000;12(2):89–96. Ungvari GS, Leung CM, Wong MK, Lau J. Benzodiazepines in the treatment of catatonic syndrome. Acta Psychiatr Scand. 1994;89(4):285–288. Yassa R, Iskandar H, Lalinec M, Cleto L. Lorazepam as an adjunct in the treatment of catatonic states: an open clinical trial. J Clin Psychopharmacol. 1990;10(1):66–68. Northoff G, Wenke J, Demisch L, Eckert J, Gille B, Pflug B. Catatonia: short-term response to lorazepam and dopaminergic metabolism. Psychopharmacology (Berl). 1995;122(2):182–186. Bush G, Fink M, Petrides G, Dowling F, Francis A. Catatonia. II. Treatment with lorazepam and electroconvulsive therapy. Acta Psychiatr Scand. 1996;93(2):137–143. Bush G, Fink M, Petrides G, Dowling F, Francis A. Catatonia. I. Rating scale and standardized examination. Acta Psychiatr Scand. 1996;93(2):129–136. England ML, Ongür D, Konopaske GT, Karmacharya R. Catatonia in psychotic patients: clinical features and treatment responses. J Neuropsychiatry Clin Neurosci. 2011;23(2):223–226. Rosebush PI, Hildebrand AM, Furlong BG, Mazurek MF. Catatonic syndrome in a general psychiatric inpatient population: frequency, clinical presentation, and response to lorazepam. J Clin Psychiatry. 1990;51(9):357–362. Cristancho P, Jewkes D, Mon T, Conway C. Successful use of right unilateral ECT forcatatonia: a case series. J ECT. 2014;30(1):69–72. Girish K, Gill N. Electroconvulsive therapy in lorazepam non-responsive catatonia. Indian J Psychiatry. 2003;45(1):21–25. Medda P, Toni C, Luchini F, Giorgi Mariani M, Mauri M, Perugi G. Catatonia in 26 patients with bipolar disorder: clinical features and response to electroconvulsive therapy. Bipolar Disord. 2015;17(8):892–901. Van Waarde JA, Tuerlings JH, Verwey B, van der Mast RC. Electroconvulsive therapy for catatonia: treatment characteristics and outcomes in 27 patients. J ECT. 2010;26(4):248–252. Kugler J, Hauptman A, Collier S, et al. Treatment of catatonia with ultrabrief right unilateral electroconvulsive therapy: a case series. J ECT. 2015;31(3):192–196. Rohland BM, Carroll BT, Jacoby RG. ECT in the treatment of the catatonic syndrome. J Affect Disord. 1993;29(4):255–261. Martenyi F, Metcalfe S, Schausberger B, Dossenbach MR. An efficacy analysis of olanzapine treatment data in schizophrenia patients with catatonic signs and symptoms. J Clin Psychiatry. 2001;62 (Suppl 2):25–27. Yoshimura B, Hirota T, Takaki M, Kishi Y. Is quetiapine suitable for treatment of acute schizophrenia with catatonic stupor? A case series of 39 patients. Neuropsychiatr Dis Treat. 2013;9:1565–1571. Cohen D, Nicoulaud L, Maturana A, et al. Investigating the use of packing therapy in adolescents with catatonia: a retrospective study. Clin Neuropsychiatry. 2009;6(1):29–34. McDaniel WW, Spiegel DR, Sahota AK. Topiramate effect in catatonia: a case series. J Neuropsychiatry Clin Neurosci. 2006;18(2):234–238. Ungvari GS. Amineptine treatment of persistent catatonic symptoms in schizophrenia: a controlled study. Neuropsychopharmacol Hung. 2010;12(4):463–467. Northoff G, Eckert J, Fritze J. Glutamatergic dysfunction in catatonia? Successful treatment of three acute akinetic catatonic patients with the NMDA antagonist amantadine. J Neurol Neurosurg Psychiatry. 1997;62(4):404–406. de Lucena DF, Pinto JP, Hallak JE, Crippa JA, Gama CS. Short-term treatment of catatonia with amantadine in schizophrenia and schizoaffective disorder. J Clin Psychopharmacol. 2012;32(4):569–572. CEBM. Oxford Centre for Evidence-based Medicine – Levels of Evidence; 2009. Available from: http://www.cebm.net/oxford-centre-evidence-based-medicine-levels-evidence-march-2009/. Accessed July 3, 2017. American Psychiatric Association. Diagnostic and Statistical Manual of Mental Disorders: DSM-III-R. 3th ed. Washington, DC: American Psychiatric Publishing; 1988. Lohr JB, Wisniewski AA. Movement disorders: a neuro-psychiatric approach. New York: Guilford; 1987. McCall WV, Shelp FE, Donald WM. Controlled investigation of the amobarbital interview for catatonic mutism. Am J Psychiatry. 1992; 149:202–206.